Designed by WGR Sprague in 1913, the 425-seat Ambassadors Theatre  is probably best known today as having been the West End’s long-term home of Stomp , but it has a more interesting history than that might imply. One of a pair of neighbouring theatres designed by Sprague, it was the original home to The Mousetrap before it moved next door to the St Martin’s. In 1996, the theatre was temporarily split into two studio spaces to house a three-year residency from the Royal Court while its home in Sloane Square was refurbished, and it later became home to Sonia Friedman Productions (during Ambassador Theatre Group ’s ownership) in the early 2000s. During that time, it had a reputation as a home for new writing. 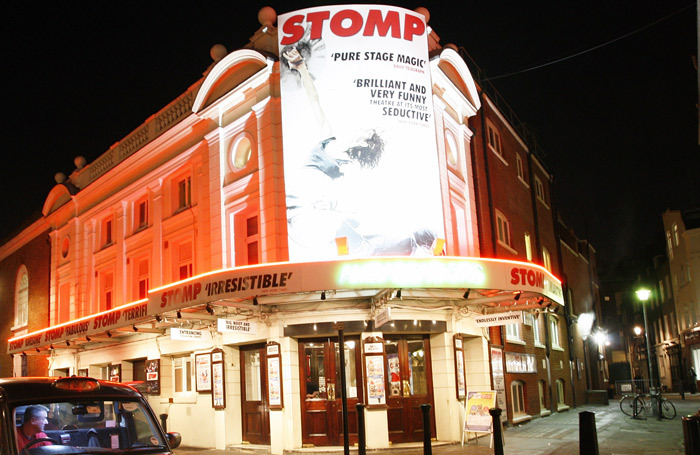 Its current owner Stephen Waley-Cohen bought the theatre from ATG in 2007  and soon installed Stomp, which ran for most of his tenure. When Cameron Mackintosh announced he had purchased the theatre in 2014 as part of a double deal with the Victoria Palace, it looked like the theatre would be transformed into a receiving house for transfers of plays from the subsidised sector. Last month, that deal appeared to be dead in the water, after Waley-Cohen revealed that in the time it had taken Mackintosh to confirm the purchase – and after public comments questioning whether he would still be able to afford the deal after rising costs at the Victoria Palace – Waley-Cohen received a higher offer. What happens next? I understand there are now several rival bidders. You would expect the usual suspects to be in the mix, especially those who were unsuccessful in their attempts to land the Theatre Royal Haymarket  earlier this year. Andrew Lloyd Webber is unlikely to be interested in a small playhouse, but I’d expect bids from ATG, Trafalgar Entertainment, Nimax, and maybe Access, Len Blavatnik’s company that bought the Haymarket . That purchase of the Haymarket – at more than £45 million – will have forced up the price. The Ambassadors is not as prestigious or large as the Haymarket so will not reach those levels, but it is freehold and offers development opportunities. If the price stays relatively sensible (the proposed original sale price is thought to have been around £5 million), it might even provide the last obvious chance for a new player to enter the West End theatre ownership club. That means it wouldn’t be surprising to see a few independent drama producers throwing their hats in the ring: would Friedman perhaps consider a return to her old stomping ground?